Thursday, 22 June, 2017: A spectacular moment in time that brought together the three arms of the South African government in a triumph of constitutionalism and a sham of political accountability. While the Constitutional Court again shone as the nation’s true north, President Jacob Zuma used the platform of Parliament to display his invincibility. “Sit in peace,” Zuma told the opposition on the same day the Chief Justice eloquently spelt out the constitutional obligations on the president, the Speaker and MPs. The ANC’s reaction to the judgment is indicative of why Zuma remains indomitable. By RANJENI MUNUSAMY. “I could stand in the middle of 5th Avenue and shoot somebody and I wouldn’t lose voters,” he said. Judging by the outcome of the November US presidential election, perhaps he was right. Trump did everything possible except shoot somebody on a crowded New York street to lose the election and he still became president. In South Africa, President Zuma is doing everything possible to make the case for him to be removed as president. He has violated the Constitution, appointed liars and crooks in his Cabinet, prompted three credit downgrades, almost single-handedly caused a recession, neglected his party’s electoral mandate, increased the rate of unemployment and surrendered his presidential powers to his dodgy friends, the Guptas, so that they can use the state as a feeding trough. The option of a secret ballot in a motion of no confidence against Zuma, which Speaker Baleka Mbete now has to decide on, was aimed at saving the ANC from itself. Because the ANC is in a state of paralysis generally and is completely incapable of holding the president to account, the only legal means of relieving the country of his disastrous leadership is through a vote in Parliament. But the ANC’s default reaction is to defend the president rather than examine the merits of this particular motion. While the ANC leadership and parliamentary caucus have decided that its MPs would vote against the motion, there are some ANC members who have had enough of Zuma. Opposition parties led by the United Democratic Movement approached the Constitutional Court to request that voting on the motion of no confidence against the president be conducted by secret ballot after Mbete claimed she did not have the powers to grant this. In a profound and riveting unanimous judgment written by Chief Justice Mogoeng Mogoeng, the court took the opportunity to spell out the constitutional obligations on elected representatives and the purpose of accountability mechanisms. “The Preamble to our Constitution is a characteristically terse but profound recordal of where we come from, what aspirations we espouse and how we seek to realise them. Our public representatives are thus required never to forget the role of this vision as both the vehicle and directional points desperately needed for the successful navigation of the way towards the fulfilment of their constitutional obligations,” Mogoeng said. He said a motion of no confidence in the head of state was “a very important matter” and “a potent tool” inextricably connected to the foundational values of accountability and responsiveness to the needs of the people. “A motion of no confidence constitutes a threat of the ultimate sanction the National Assembly can impose on the President and Cabinet should they fail or be perceived to have failed to carry out their constitutional obligations. It is one of the most effective accountability or consequence-enforcement tools designed to continuously remind the President and Cabinet of what could happen should regular mechanisms prove or appear to be ineffective,” the judgment stated. 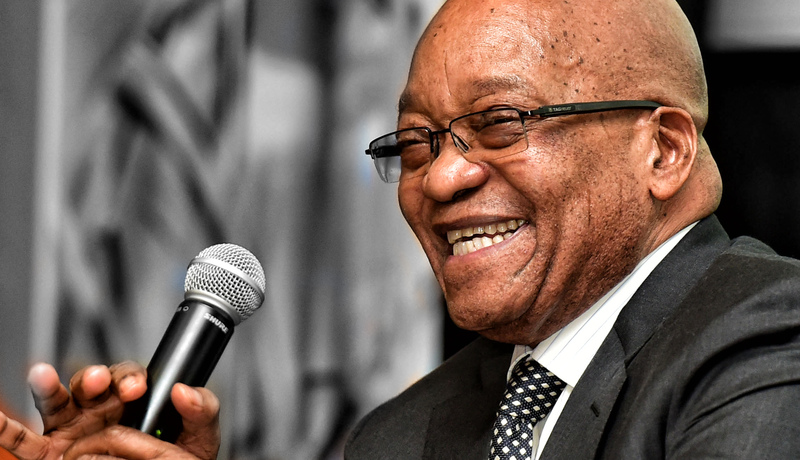 But as Zuma gleefully pointed out in the National Assembly later on Thursday, there have already been seven motions of no confidence against him – all of which obviously failed. As with everything else in the Jacob Zuma era, the sword that ought to have compelled him to “always do the right thing” was rendered ineffectual. Answering questions in Parliament, Zuma was seemingly unmoved by the Chief Justice’s warnings about the consequences of not living up to his constitutional obligations. Quite astoundingly, Zuma claimed that South Africans were not unhappy with his leadership and said he did not believe people were worried by media reports on state capture and the Gupta emails. “The people of South Africa did not make a mistake in electing me as president of this country. I am fit and it’s running very well,” Zuma said, giggling intermittently during the session. He also claimed that if another election had to be held right now, the Democratic Alliance (DA) would lose control of the metros they took from the ANC last year and that his party would win the elections in 2019. Responding to questions from DA leader Mmusi Maimane, Zuma also shrugged off blame for the credit rating downgrades and the recession. This splendid disconnect from reality should have caused even more consternation in the ANC benches. Surely any reasonable person would know that Zuma plunged the country into crisis after crisis, with severe economic consequences. But before and after his performance in the House on Thursday, ANC MPs rose to give the president a standing ovation. Clearly Mogoeng’s words earlier in the day washed over them. However, the ANC appears to have perceived Mogoeng’s words differently, judging by the statements issued in response to the judgment. So it falls to Speaker Baleka Mbete to test whether this is true as she reschedules the motion of no confidence and decides whether to allow a vote by secret ballot. Mogoeng said in the judgment that there must always be “a proper and rational basis for whatever choice the Speaker makes in the exercise of the constitutional power to determine the voting procedure”. So while the president made it clear the secret ballot is unnecessary and her party thinks that the opposition parties were “mischievous” in their efforts to secure it, Mbete needs to be careful not to be dragged back to court for failing to act rationally. The judgment stated: “The Speaker has made it abundantly clear that she is not averse to a motion of no confidence in the President being decided upon by a secret ballot. She only lamented the perceived constitutional and regulatory reality that she lacked the power to authorise voting by secret ballot. Meaning, now that it has been explained that she has the power to do that which she is not averse to, she has the properly guided latitude to prescribe what she considers to be the appropriate voting procedure in the circumstances. “This Court cannot assume that she will not act in line with the legal position and conditionalities as now clarified by this Court,” Mogoeng said. But when it comes to Zuma, Mbete and the ANC, the proclivity to do the wrong thing is seldom missed. If the ANC is sure its members have full confidence in the president, why not allow the secret ballot? Zuma remains cocksure about his position because he knows the majority of the people in the ANC national executive committee and the parliamentary caucus always put the party and their own interests above that of the country. He said he would not step down until the ANC compelled him to. “The ANC elected me to be the president. The day it thinks I can’t be the president, it will remove me. The ANC has not done so, so I can’t do so,” he said gaily to the National Assembly.